Interested in visiting the Birthplace? Learn about how your family, tour group, or Girl Scout troop can experience the place where it all began. Online tickets for our tour or Girl Scout Troop program are available up to six months in advance. Juliette believed that “Girl Scouting and Girl Guiding can be the magic thread that links youth of the world together.” Keep her vision alive. Give to the Birthplace today to help build girls of courage, confidence, and character who make the world a better place. Girl Scouts of the USA was recently awarded a $178,000 federal grant from the Institute for Museum and Library Services (IMLS) for a new initiative called Access for All. Last month, a group of 60 Girl Scout alums, troop leaders and supporters wandered from all corners of the United States to Savannah, the city where the Girl Scout Movement was born over 106 years ago. Here they participated in a convening hosted by the Juliette Gordon Low Birthplace called “Wander Woman: A Girl Scout Wayfaring Weekend,” which featured a broad range of activities and experiences centered on themes of women, travel, and global citizenship. 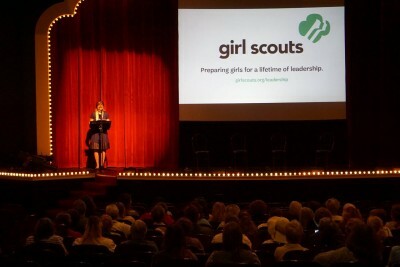 Join us at the Historic Savannah Theatre for this one-time-only film screening and panel discussion will explore how Girl Scouts have gathered together to make a difference at home and abroad for more than 100 years. GSUSA is pleased to announce a plan to make further investments the Juliette Gordon Low Birthplace, allowing us to better serve our mission. After years of work to complete important exterior and structural renovations, and careful consideration and communication with pertinent stakeholders, Girl Scouts has created our SAFE (Sustainable, Accessible, Flexible and Engaged) site use master plan.